Villena is a city that has two main churches. Each of them have a clocktower pacing the time every hour since 300 years ago. Before there was a third clocktower, "El Orejón". This tower was built on the west edge of the Market square in Villena. This was a clocktower built by the civilians, not by the religious power. So for a while, civilians and neighbours held the control of time in the city. After several attempts of the religious leaders to dismantle the clock they succeed. Finally the influence and power of the Church made the City Council demolish the civilian tower. So from now on, the Church is back in the business of controlling time in the city. Ironically the Orejón Bell was placed on the top of Santa Maria Church were it remains silent. "Recuperar el Orejón" is a sound installation built over a rooftop nearby where the actual Tower of "El Orejón" stand in the past. The system works as a clock, every hour it triggers the amount of bell rings to determine what hour it is. The system was made using Max MSP and recordings done with the same Bell that use to ring back 300 years ago. During the 24th of July 2014. From 10 am to 19 pm the bells of "El Orejón" ring again for the first time in 300 years. 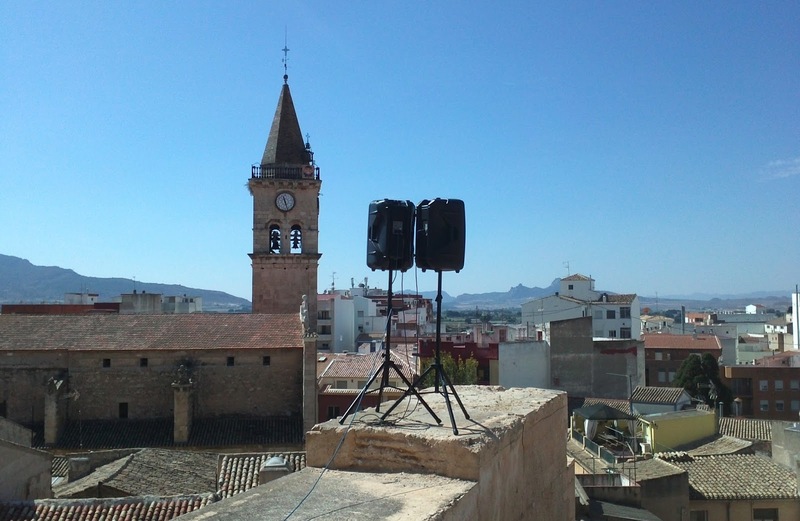 The sound system was powerful enough to wake neighbours and transform for a few hours the soundscape of a city like Villena. This project was part of the two-weeks workshop on Soundscape held at El Casc Festival organised by El Fabricante de Esferas. A version of this same piece was replicated by Felipe Navarro in April 2015. This work was done with the help and collaboration of Felipe Navarro, Serhat Yildiz, Abdullah Addas, and Xiaoyu Zhu.